The most important things I will take with me from this semester are my reframed identity as an American, my commitment to not repeat past mistakes, and my continued questions about the justness of the war in Iraq. I struggled this semester with my national identity as an American. Before this semester, I thought we had a proud history, that our forefathers were untainted, honorable, noble heroes of liberty, blazing the trail to being the freest country in the world. However, I was under a convenient, easier-to-stomach illusion fed to me all throughout my public school education. As the semester progressed, I became embarrassed and ashamed of linking my history with “our” history as Americans – but we are guilty of genocide, of grave social injustices. Columbus Day will forever be a dark day to me after this semester. I cried many tears while reading of the American Holocaust of native Americans, and of our many broken promises. The “We the people of the United States” did not include Native Americans or blacks or women or white servants, and there are still those today who maintain racist, sexist and classist attitudes. 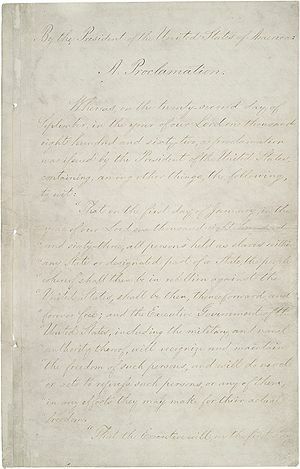 The Emancipation Proclamation was not about freeing slaves, it was a partial concession to abolitionists and an ultimatum to get the south to stop rebelling. I realized that the way to cope with this reality is to see it like I see myself – as a work in progress. I did things before I knew God that would be hard to believe I was capable of, if I hadn’t been there to witness it. But I’m not going to keep beating myself up about it – and neither should we, as Americans (lest we risk offending the Creator). We should just make very sure that we never repeat past mistakes. But – are we making sure of it? Is history repeating or maintaining itself – have we not learned from our mistakes? I found myself asking this many times this semester. Are the elites of today just as separated from the poor and those being discriminated against as they were before the Civil War? Are they as focused on their own interests today as they were then? Aren’t we part of the problems that we see in the world today, if we are as inactive as the elite on whom we place the responsibility for fixing those problems? The risk of death is just as great for illegal immigrants crossing into the U.S. from various places south of the border, as when the slaves and the Irish and others came to America aboard ships. And don’t we do the same to today’s immigrants when they get here — pay them slave wages for hard labor? Are we motivated more by profit than by our consciences, even today? Those who do the jobs nobody else wants, get paid far less than those who sit down or play all day at the top of some corporate ladder — who agree to pay the hard workers nothing (“slave wages”) compared to what the CEOs make, just for their own profit. So, maybe slavery … “is”… a U.S. thing? But it seems to me that people today (at least in the U.S.) are — comfortable… or too busy paying the bills to protest their meager wages. Most of our poor live like kings compared to the poor in third world countries — or is that a line I’ve been fed? If so, what can we do about it? Most people seem too comfortable, too apathetic, or too busy paying the bills to make any sort of effort in this area. I try to look for opportunities to help others, but I know I could be doing more. One question I continue to chew on, is why some think the war in Iraq is an unjust war. Is it wrong, if there are genuine problems being caused by those in power of a country, if the power is not respected by “the people” of that country, to displace the people in power? This also came up in my critical thinking class. Would you not prevent a helpless victim from getting beat up? If you could, wouldn’t you stop the aggressor? If you would – wouldn’t you remove Saddam Hussein from power, if you had the ability, as America did and does? Don’t those in power (America, Saddam Hussein before being removed) have a responsibility to protect the weak (people of Iraq)? The war in Iraq was compared this semester to the Revolutionary War, Civil War and the war with Mexico, as we were asked to compare the language used to promote all four wars. Perhaps in the past the language was deceptive, but in the present it is accurate? Or, perhaps it is still deceptive, perhaps there are ulterior motives in the present as in the past – but there was still good reason to remove Hussein from power, even if that reason was only a promoter, and not the real motive, of the war? The only thing I can make sure of is that I myself follow God’s will in loving others as I love myself. No doubt if every individual alive did that, there would be no war in Iraq. This semester was an eye-opener, and an important one. I appreciate Stannard, Zinn and DeJesus-Riley for introducing me to “radical history” and the convicting self-reflection that necessarily comes with it.